As I pull myself out of my post-vacation lull and get back into the swing of things here in Denver, or more accurately, get hit over the head again and again by the proverbial swing that is my job, I thought I would bide some blog time by leaving you with one last post of my journeys down to Chile. I think I summed up my food highlights well (or at least thoroughly) in my last post, but I wanted to share some images from an amazing city: Valparaiso. If you made it through my lengthy Chile mayo post, you may remember that Valparaiso was the town that enchanted me with its winding streets, vibrant murals, stunning views and of course, as the epicenter of the Chorrillana, which is served without any mayonnaise at all. The Chorrillana, it bears repeating, is a wonderful creation of fries covered in egg, grilled onion and slices of beef. I was lucky enough to enjoy one in its apparent birthplace, J Cruz M Casino Social y Museo. There are imitators all over Chile, but the J Cruz M Casino Social has the original. Also original was the amazing decor, which I guess was the museum part. And the entertainment by the host. Although the Chorrillana does deserve multiple posts (actually Denveater's post makes it four mentions in a week for Denver blogs), I would like to turn your attention to the actual city itself, Valparaiso. Valparaiso is a port city just west of Santiago that was one of the main stopovers for ships going to and from the Atlantic and the Pacific before the construction of the Panama Canal. It is built on a series of forty-some cerros (hills) that rise steeply from the water, and each one is crisscrossed by winding streets, staircases and passageways. And everywhere there are murals. In fact there is even an open air museum that takes you through some of the cities best murals. We spent two days just wandering the streets and looking at murals. This beats an inside museum any day. There were also amazing views. Especially from our hotel. The lovely Cirilo Armstrong. 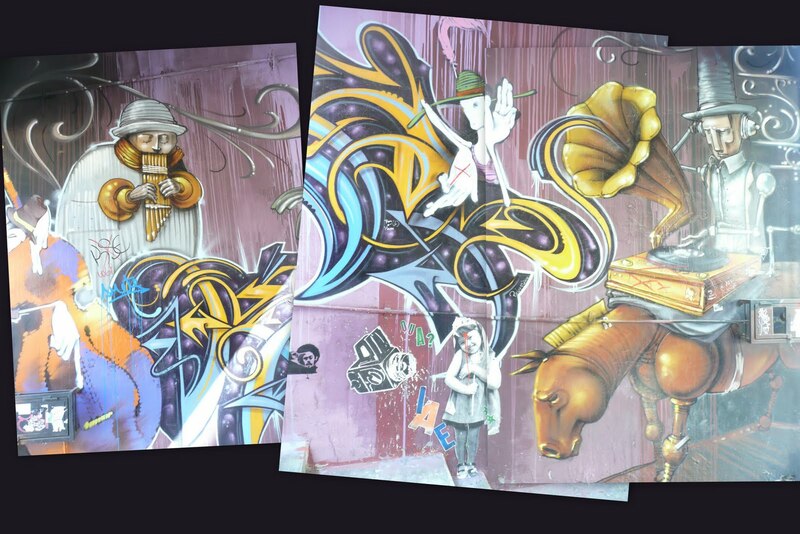 OK, here's a few more murals. This one is slated to become my new profile image. Our last night in Chile. Watching the sunset from the neighboring town of Viña del Mar. Now back in Denver, you can see why it was so hard to get back to work, and even to sit down in front of a computer again. But I am beginning to feel invigorated again and am going to take up a new cause: try and convince a Denver area restaurant to come up with their own version of the Chorrillana. That way we can all come under its mystic and greasy spell without having to travel all the way to Chile. awesome post. i´m not biased or anything.